Destination cover-Delhi- Jabalpur- Bedhaghat- Dhindori- Gond & Baiga village- Bandhavgarh national park & the famous Khajuraho temple. Upon arrival meet our representative at the airport and transfer to hotel . Morning take flight for Jablpur and upon arrival meet our representative at the airport and transfer to hotel near Bedhaghat , while boating on Narmada river enjoy the gorgesous marble rocks mountain of both side. Morning visit the 64 yogini temple (10th c AD) and then check out departure towards Dhindori. Check in a clean comfort hotel at there. 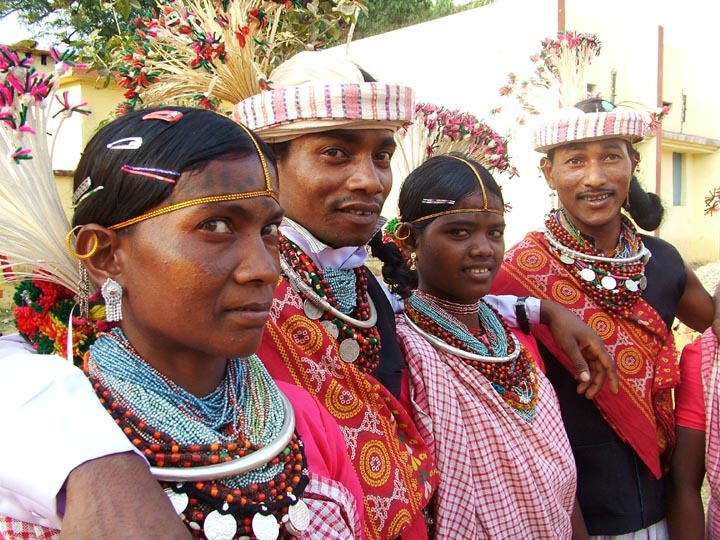 Meet the Colorful Gond and Baiga tribes at their different village, full day excursion at their village hygienic lunch at the isolated tribal village, if permit enjoy the Baiga dance at there ( subject to available the drum men). Overnight at the same hotel at Dhindori. Morning after breakfast drive towards Bandhavgarh ( famous for wild tiger on nature) , after noon meet the wild tiger on nature while roaming inside the national park over open jeep. Overnight at the decent resort at Bandhavgarh. Morning and afternoon meet the wildlife including wild tiger on nature over open jeep safari. Overnight at the same resort at Bandhavgarh. Morning after breakfast check out and departure towards Khajuraho, check in a nice star category hotel and enjoy the light and sound program at the back drop of famous Khajuraho temple. Morning visit the world famous Khajuraho temple ( 10-11 c AD, western group of temple , world heritage site by UNESCO) and excursion the language of love in the form of real ancient “ Kamasutra” with our expert. Also visit the eastern group of jain temples. Morning after breakfast check out from hotel and board the day flight for Delhi towards your onwards destination with lots of sweet memories with you. Note- We choose Bandhavgarh national park in our program , though it comes under deciduous forest and geographically suitable for animal world ( herbivorous and carnivorous) is the highest density of tiger population accordingly the area . it’s much sure to sighting of wild tiger on nature. Bandhavgarh national park has been closed during monsoon ( from 15th June to 15th Oct , every year). Permit and entry for this national park has been open 90 before , to overlooking the demand your early confirmation is highly appreciable. Shiva Ratri 24th Feb. 14th Feb.